Teaching math concepts beyond traditional number problems opens up creative opportunities for both teachers and students. Different strategies include the use of poetry, stories, engaging articles, and activities that get the body and mind working in unison. Come explore the world of “Math Concepts” in the Guardian Angel Kids February 2012 issue and learn how to tell time, add, subtract, and divide, rap to numbers through poetry, learn the history of pennies, how powerful zero truly is, and hands on math activities. Make it a family learning experience and fun will surely be had by one and all. “Can You Tell Time?” quiz by Marion Tickner – explores the different timepieces before the technology explosion. “How Many Are Half?” poetry by Donna J. Shepherd – Grandma’s delicious chocolate chip cookie treat and how the cookies are shared. “Numbers Rap,” poetry by Bill Kirk – the wonder of numbers all around us. “Cookies with Sprinkles,” by Shari L. Klase and illustrated by Julie Hammond – a whimsical adventure to Grandma’s house. “The Value of Pennies,” by Gina Napoli – discover the history and significance of pennies. “The All Powerful Nothing,” by Mary Reina – learn about the power of zero and how it turns nothing into something. 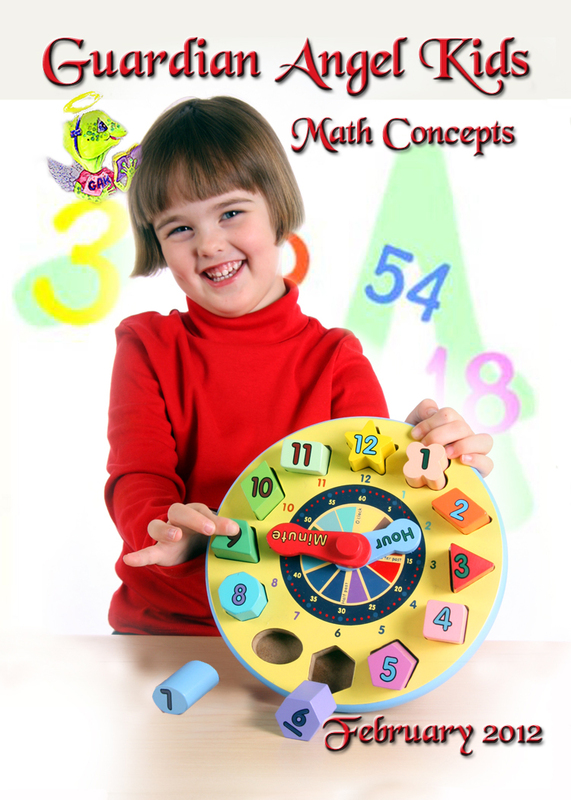 “Hands on Math Activities for Home or School,” by Kathy Stemke – get moving and grooving with enjoyable Math activities. “Hopscotch Math,” by Karen Robuck – teach and reinforce basic Math skills with the fun of hopscotch. Visit Guardian Angel Kid today and www.guardian-angel-kids.com and enjoy a child safe and ad free Ezine. We also invite you to stay connected with Guardian Angel Kids through our Facebook Fan Page http://www.facebook.com/pages/Guardian-Angel-Kids-Ezine/163785080346247. Please feel free to drop Editor-in-Chief, Donna McDine an email at submissions@guardian-angel-kids.com and let them know what you think of Guardian Angel Kids and what you’d like to see in the future. They aim to please. The Guardian Angel Kids Ezine staff and contributors look forward to your visit. Thank you for your time and interest.